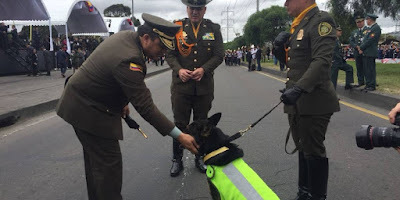 A police dog in Colombia that has sniffed out record amounts of drugs had to be relocated and given police protection after a gang put a $70,000 bounty on her head. 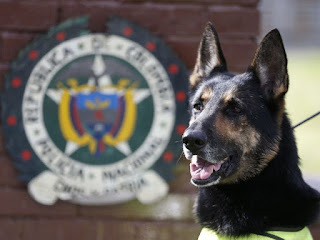 Sombra has taken part in operations leading to the arrest of 245, and has found over nine tonnes of cocaine. The cocaine mainly belonged to the Urabeños gang, also known as El Clan del Golfo (The Gulf's Clan). The gang has put a bounty of 200 million pesos to kill 'Sombra'. 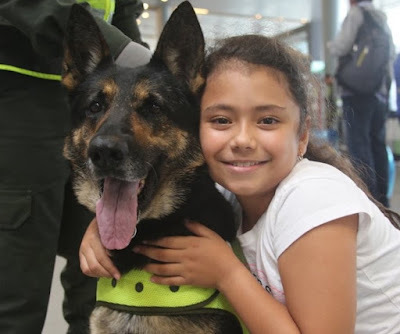 Sombra (whose name means "shadow") has been moved to the El Dorado airport in Bogotá for her own safety. Over last three years she became the "torment" of the gang. A few weeks ago her infallible nose discovered 5.3 tons of cocaine in Turbo (Antioquia), belonging to the 'Clan del Golfo'.